Diaper: finishing our last box of Pampers size 2 & then moving on to the Costco size 3! G is drinking 4 bottles a day, eating solids 3 times a day, and having some snacks during the day. I think we are about ready to cute back to 3 bottles a day...little bit of a lack of interest going on. Grayson is still loving being able to sit in his high chair and eat dinner with us. He has had butternut squash, sweet potatoes, apples, pears, carrots, parsnips, peas, mango, papaya, banana, avocado, blueberries, green beans, yogurt, puffs, yogurt melts, and his new favorite....CHEERIOS! Thank the Lord for cheerios. They make our boy so incredibly happy. I have to brag on his fine motor skills...he is so good at picking up his cheerios and actually getting them in his mouth! However, the dogs are loving when he does drop them. :) Cheerios save the day at school when his buddies are eating and he gets grouchy. They get their bottles and he sits in the chair and chows down on cheerios! We will be introducing some meats soon! Grayson still loves school and socializing with his friends. However, we have entered into the separation anxiety stage. He has started getting sad when I drop him off...which is no fun. Grayson is all about some mama recently, which is great, but makes it a little difficult to get things done! 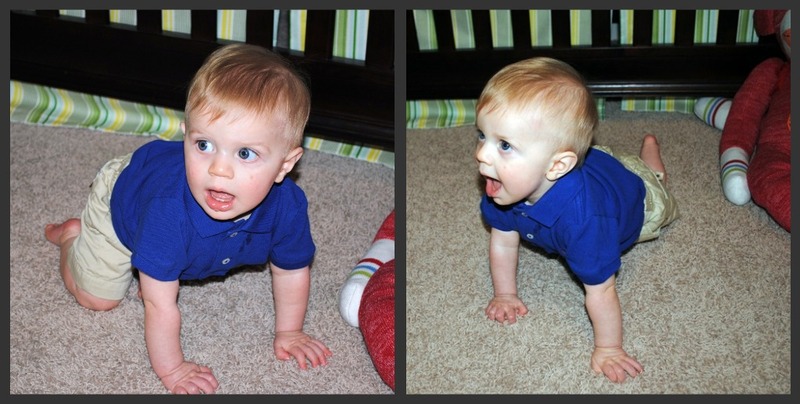 In honor of his 8 month birthday, G started crawling this morning! Bring on the baby proofing! I'm pretty sure that the dogs are not prepared for this milestone. Grayson has been wanting to crawl after them for awhile & now it can actually happen! I will get a video of our newly mobile baby in action soon! Grayson also started clapping this month...it's pretty cute! Some of Grayson's favorite things this month are: being thrown in the air by daddy, grabbing Jack's tennis ball when we are playing fetch, his new table toy, any remote, finger foods, the jumperoo, clapping, being outside, banging his hands on his toys, and now crawling!! This past month has been a month of baby sickness. G has had 2 ear infections this month & has been coughing & congested for weeks. I am hoping this is not a trend! He is pitiful when he is sick but he is a pretty big fan of all medicine...especially fruity flavored ones! Grayson is about to have 6 teeth. He has the bottom 2, has a top one poking through quite a bit that we are still working on, AND more top ones starting to poke through. That means 4 teeth coming in at once. Holy cow....bring on the steak! It is so hard for me to believe that my teeny newborn is now 8 months old. I was going through a box of his newborn clothes the other day and started crying. Grayson is growing up so fast! Being a mama to this sweet boy is the best job in the world & I have loved watching him learn and change over the past 8 months. Grayson is so happy and just makes everyone around him smile! I know I may be a little biased, but he has the best personality & he makes me such a happy girl! 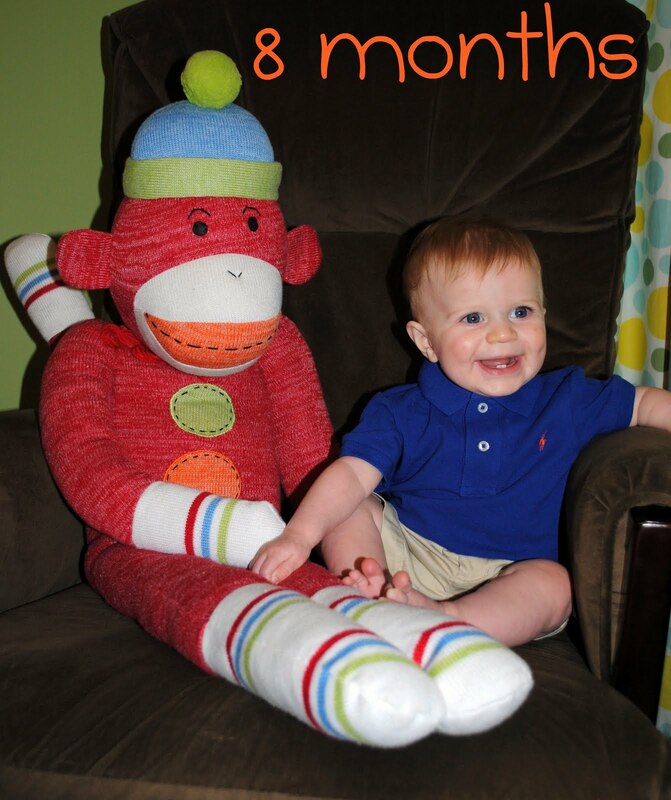 Happy 8 months, little G! these are great pictures....i swear that monkey looks alive! What a happy boy!! & oh my gosh, I can't believe he has 6 TEETH & crawling! YAY!